The Cleveland Senior Citizens Advisory Committee visited one of the city's newest facilities Tuesday, the Cleveland Regional Jetport. Mayor Tom Rowland reviewed the city's aviation history, beginning with Emmett Field early in the last century. He talked about the long effort to replace Hardwick Field, the city's second airport, with the new Jetport. "Hardwick field just became inadequate," the mayor said. The Regional Jetport has already been a factor in major industries' decisions favoring Cleveland, Mayor Rowland said. In addition, he said, the Jetport creates revenue from fuel sales and personal property taxes on aircraft. All city residents benefit from the Jetport too, he said. One of those benefits for city residents only is free service by the LifeForce medical helicopter based here. Thanks to an agreement with the Cleveland City Council, the city covers the flight expense after insurance payments are made. Mark Fidler updated the committee on current Jetport growth and runway expansion. Construction is underway to add 700 feet to the 5,500 foot runway. The longer runway will be available to accommodate larger aircraft later this year. Committee members wanted to know how the extension is funded. Fidler said 95 percent is through the state government and five percent from the city. Opened just over four years ago, the Regional Jetport continues to grow, Fidler said. "We have more hangars going up all the time," Fidler said. A growing number of aircraft owners want to base their planes in Cleveland. In other business, committee members raised several neighborhood traffic safety concerns, especially speeding by motorists taking short cuts or detours through residential areas. Committee members expressed concern about the long wait for a veterans' home here. Mayor Rowland said all that can be done by the city, county, state and the local Congressional delegation has been done. The mayor also reported steps are being taken on some concerns expressed by committee members at their earlier session. Grants have been obtained for two covered city bus stops, he said. He said he continues to support Saturday bus service. Committee members questioned manhole covers being uneven with street pavement, especially on Peerless Road and Candies Lane. They also discussed temporary metal plates covers being uneven with the paving at some street cuts. Members also raised a concern about some commercial tree trimmers leaving the debris they are supposed to haul away beside the streets instead. City crews have to haul the debris. Mayor Rowland thanked the committee for their service. "You are the city's eyes and ears for the senior community," he said. 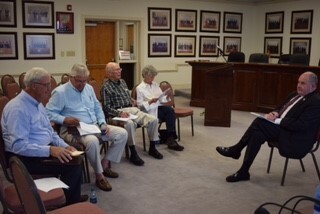 Members attending the July meeting were Jimmy Armstrong, First District; Ron Williams, Third District; Hugh Hogeman, Fifth District; Roger Jenne and Charlie McDowell, at large members. Other committee members are Jo Benjamin, Fourth District, and Shirley Knight, Second District.